Located opposite the church and next to the Memorial Garden the Blessed Sacrament Commemorative Space is comprised of specially engraved brick pavers. 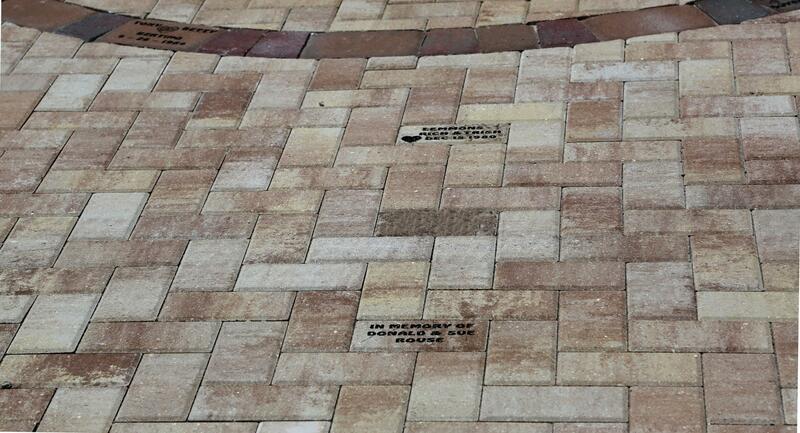 These pavers remember loved ones that have died as well as commemorating families and special events such as weddings, anniversaries, baptisms, or more. Etched in stone, this type of remembrance is a constant reminder and a living tribute to those we love. This area of personalized pavers is an ongoing project of Blessed Sacrament and helps to support the work of our parish community. Pavers come in two sizes 4" x 8" and 6" x 9". The smaller pavers can hold up to 3 lines of engraving with 14 characters per line. The larger stone can hold 4 lines of engraving with 14 characters per line. Clipart symbols are also available. The smaller pavers are $75 and the larger pavers are $100. A clipart symbol can be added to your paver for an additional $10.